In our last post we looked at three aspects of event planning that are commonly overlooked, leaving attendees feeling disengaged and uninspired. If you’re responsible for organising conferences for your company, avoid making these next three mistakes to make sure your guests can make the most of their trip. Mistake 4: Relying on a formulaic set-up. It’s tempting to apply the “if it ain’t broke, don’t fix it” mentality, but conventional seating simply doesn’t inspire anyone and theatre-style rows only obstruct interaction. 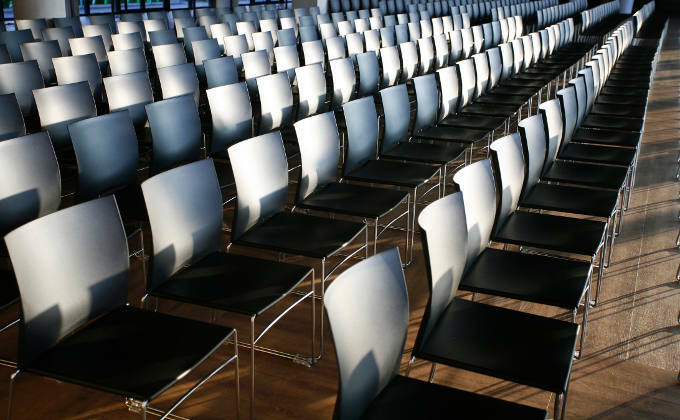 If at all possible, improve audience engagement by sitting attendees in flexible, grouped seating spaces, where chairs can be moved to face each other when required. There are lots of creative ways to address the problem of stuffy seating, just make sure to find a solution that fits your room and your audience. Mistake 5: Repetitive or uninteresting speakers. When presentations are the core of your event, it’s important that the speakers you choose not only have an interesting story to tell, but that their delivery or perspective is different from the rest of your line-up. Even if you have the top names in your industry, your audience will get bored hearing the same message simply repeated in different voices. Your ability to control this may depend on whether you’ve hired professional, experienced presenters or are relying on smaller names that have agreed to speak in exchange for the exposure. Hiring a coach to prepare speakers and run through their presentations can be a wise investment. It’s also worth reminding your speakers that there are plenty of ways in which they can add variety to their presentations. Live demonstrations, props and yes, interactivity using an Audience Response System can all make their session engaging and memorable. Mistake 6: Letting the timetable slip. There isn’t a single person who is pleased when a session runs over. Whether your speaker got carried away or your scheduling simply succumbed to lots of minor delays here and there, a delayed start or finish to a session has an irritating knock-on effect for everyone involved. The worst way to fix the problem? To cut down valuable Q&A sessions or shorten much-needed refreshment breaks. Instead, put more effort into ensuring your speakers are well-rehearsed, and provide them with a visible time-keeper. Arrange for a moderator or organiser to manage slots – including breaks – if necessary. Event planners have so much to organise that it’s virtually impossible for every moment to run seamlessly. However, the three mistakes here (and the ones we spoke about in our last post) can be easily avoided and will make a huge difference to your participants. If you would like any more details or tips about using an Audience Response System for your conference, please get in touch, or read some more of our recent posts for ideas.